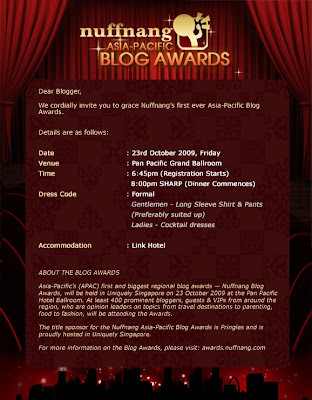 I've been invited to the NuffNang Awards in Singapore! and guess who's going with me? something in green and has a lot of teeth. Who else is going to? let's gang up and hit the Singapore together! omg.. cocktail dress? what does a plus size + cocktail dress look like?! Im so glad that your blog is being recognized by nuffnang. Have lots of fun dear. pigita: no..! wrong answer! but quite good answer lol..... thanks! Thanks Fatin! nah.. i'm uh.. only reaching the foothills of the big leagues! good for ya, you deserve it go have fun! Thank you Lisa :) i shall go check it out! which dorothy perkins btw? cuna: ooh babe! i'm so happy too!!! thanks for ur wishes! ok buy buy buy until ur luggage reach 15kg okay , must fully utilized it !! CY: our rm so weak.. i dun think i can shoppin there..
Jess: ok ok u sponsor $$ okay?! hahaha.. pokai already lah. Thanks!!! congratulation to u ... pls enjoy! about cocktail dress no idea how its like maybe you can google :) my thought of it it has tail? lol.. cocktail..got it? Sherry: lol u made a funny..